Start off your visit on the 12th (Wed): hit the slopes at Saariselka Ski & Sport Resort. Keep things going the next day: surround yourself with nature on a nature and wildlife tour, then examine the collection at Gold Prospector Museum, then explore the striking landscape of Urho Kekkonen National Park, and finally stop by Hippupuoti Gift Shop. To see more things to do, ratings, where to stay, and other tourist information, you can read our Saariselka planning tool . Ljubljana, Slovenia to Saariselka is an approximately 14.5-hour flight. You can also drive. Traveling from Ljubljana to Saariselka, you'll lose 1 hour due to the time zone difference. Prepare for slightly colder weather when traveling from Ljubljana in February: high temperatures in Saariselka hover around -6°C and lows are around -15°C. Wrap up your sightseeing on the 13th (Thu) early enough to travel to Levi. On the 14th (Fri), don't miss a visit to LUVATTUMAA - Levi Ice Gallery, enjoy some diversion at Kid's Land, take an exotic tour of a safari tour, then explore and take pictures at Ice Karting Levi, and finally look for all kinds of wild species at Santa"s Cottage & Pet Farm. Get ready for a full day of sightseeing on the next day: ski along the peaceful trails at Levi Ski Resort. Make your Levi itinerary with Inspirock to find out what to see and where to go. Fly from Saariselka to Levi in 3 hours. Alternatively, you can drive; or take a bus. 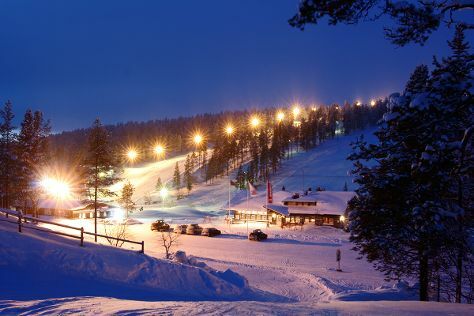 In February, daytime highs in Levi are -5°C, while nighttime lows are -12°C. Wrap up your sightseeing on the 15th (Sat) early enough to drive to Kemi. Kemi is a town and municipality of Finland. Kick off your visit on the 16th (Sun): take in the architecture and atmosphere at Tornio Church, get engrossed in the history at The Provincial Museum Of Tornio Valley, and then take in the spiritual surroundings of Kemi Church. On the 17th (Mon), you'll have a packed day of sightseeing: find something for the whole family at Duudsonit Activity Park - TornioHaparanda. To find ratings, traveler tips, photos, and tourist information, refer to the Kemi itinerary site . Getting from Levi to Kemi by car takes about 4 hours. Other options: take a bus; or do a combination of bus and train. Expect a daytime high around -4°C in February, and nighttime lows around -11°C. Finish up your sightseeing early on the 17th (Mon) so you can catch the train to Rovaniemi. Kick off your visit on the 18th (Tue): take an in-depth tour of Arktikum, identify plant and animal life at Wildlife Areas, then see Santa Claus Office, and finally find something for the whole family at Santa Claus Village. Get ready for a full day of sightseeing on the next day: look for gifts at Your Piece Of Finland, take in the views from Lumberjack's Candle Bridge, then explore the fascinating underground world of Syvasenvaara Fell, and finally get in on the family fun at SantaPark - the Home Cavern of Santa Claus. To see where to stay, more things to do, other places to visit, and other tourist information, use the Rovaniemi online attractions planner . Take a train from Kemi to Rovaniemi in 1.5 hours. Alternatively, you can take a bus; or drive. February in Rovaniemi sees daily highs of -6°C and lows of -11°C at night. Finish up your sightseeing early on the 19th (Wed) so you can travel back home.